Based on the P-500 Bazalt, the P-1000 Vulkan has been a part of Russia’s effort to modernize its navy’s missile capabilities. The P-1000 Vulkan features titanium armor and parts, instead of the heavier steel components comprising its predecessor. 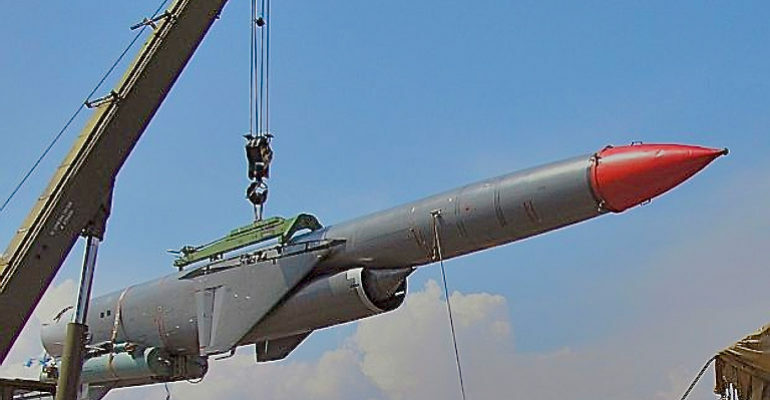 The missile was designed to be faster thanks to reduced weight of its components, as well as a more powerful booster and fuel-efficient turbojet. Active since 1987, it was the last Russian cruise missile to require submarines to surface to launch. The P-1000 Vulkan is launched in a salvo, where one missile acts as a scout to discriminate targets, and can prioritize the largest ship in a fleet. The scout seeker missile flies at an altitude between 5000-7000m to identify targets, while the other three maintain mid-level altitude. All four missiles in the salvo then go silent and lower to about 10-40 meters above sea-level to avoid radar detection. Once they reach the radar horizon, the missiles lock on to their targets and attack. The P-1000 Vulkan missile system is a comprehensive anti-ship weapon with advanced targeting technology capable of flying at mach 2. It is designed to engage highly defended enemy surface units and hit its target, avoiding radio-electronic countermeasures or counter fire. Its targets are discriminated by one of the missiles in the salvo, meaning that a counter-attack on the launch point will not stop the missiles from reaching their target. The extended range of these missiles allows for Russian cruisers to strike from safe distances, outside a defensible perimeter. The P-1000 was designed to counter American navy ships, and Russia claims the missiles can sink an aircraft carrier with one strike. The American analogue to the P-1000 is the UGM-84 Harpoon missile, which is much lighter and does not pack the same firepower. The Russians have succeeded in developing a supersonic cruise missile that the U.S. has struggled to match.